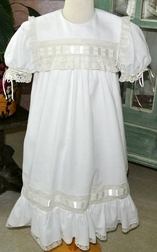 A lovely heirloom dress for flower girls, First Communion, portraits, holidays and special occasions. It is made with batiste fabric in your choice of color and is embellished with lace around the collar, sleeves and at the hem of the dress. 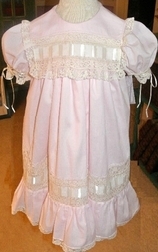 The hem of the dress is finished with a lovely ruffle and lace. And, a beautiful feature of the dress is horizontal wide white or ecru satin ribbon woven through entredeux across the square collar. 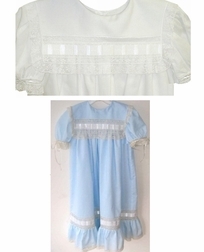 Satin ribbon also embellishes the sleeves and forms pretty petit bows. 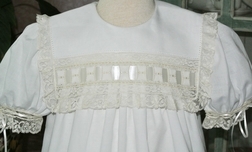 Here we show the dress in all white with ecru lace and ribbon.